You might be wondering why we didn’t simply sail the Azura from the Beaverton Yacht Club to Port Dalhousie Pier Marina. After weighing all the pros and cons we came to a decision. 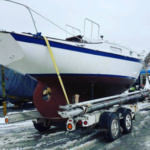 The reality is that sailing from Lake Simcoe to Lake Ontario is quite a journey, we’ve never crewed a sailboat before, and Bryan doesn’t start his sailing lessons until next month. 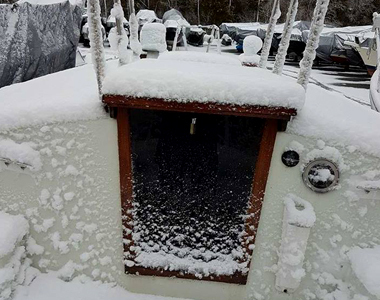 Then there is the fact that we have some necessary projects to complete such as the hatches and dorade boxes that didn’t get finished over the winter. Consideration was given to the three hour (plus) drive to Beaverton to do all the work needed before we could sail—we’d spend time on the road that could be used for paring down the to-do list. Not to mention that we drive a Jeep Wrangler which isn’t exactly known for fuel economy. 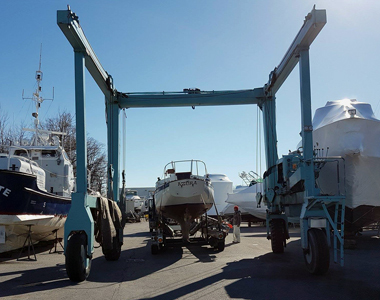 Finally, the owner of the marina in Beaverton wants to phase out all sailboats and wanted Azura off the lot by mid-May. 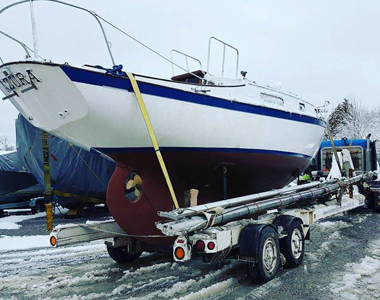 The more we thought about it, the more sense it made to bring the boat overland to somewhere a bit closer to home, so we contracted Drew Marine Transportation to handle the endeavor. Bryan took last Thursday and Friday off. The weather had been good and then, Thursday arrived complete with rainfall warnings which made preparing our sailboat for the move a very wet job. Tobias’ took a day off from school to help his Dad and the pair left the house shortly after 4:30 am. By the time they arrived at Beaverton Yacht Club it was pouring. 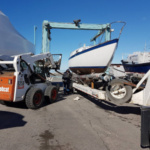 The guys removed the tarps first and then emptied the sailboat, tie-wrapped the shrouds to the two masts, and ensured that everything was secure. They made it home just in time for a supper of homemade soup which was perfect because they were both cold, drenched, and exhausted. Friday morning was as early a start as the day before. 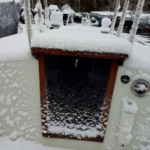 Bryan had to meet Keith, the boat mover, for 9:30 am plus account for possible delays due to commuter traffic and SNOW! You read that right and it was a mess… a snowy, wet, slushy mess. 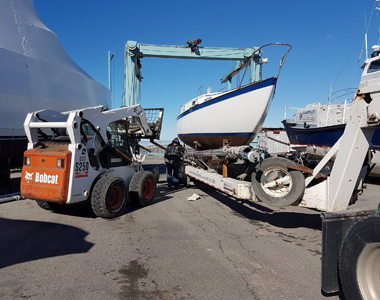 Just as Keith went to load the sailboat the guys realized that the hydraulics on the truck were frozen. 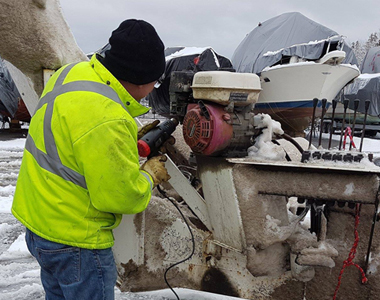 The marina loaned them a heat gun which they plugged into a generator and they ended up being able to thaw the equipment. Azura was loaded and they were off. Azura arrived in Port Dalhousie safe and sound late in the afternoon under sunny skies. The marina owners had Keith unload the sailboat right by the travel lift with a Saturday morning launch in mind. But… that’s another story and a whole other set of surprises and mishaps. PS. 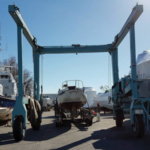 Bryan and I were so pleased with Drew Marine Transportation that we would not hesitate to recommend them to anyone. Keith went above and beyond.